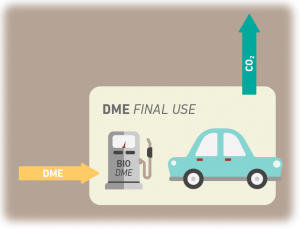 DME has been used for decades in the personal care and chemical industry, and is now increasingly being exploited for use as a clean burning alternative to LPG (liquefied petroleum gas), diesel and gasoline. Like LPG, DME is gaseous at normal temperature and pressure, but changes to a liquid when subjected to modest pressure or cooling. This easy liquefaction makes DME easy to transport and store. This and other properties, including a high oxygen content, lack of sulfur or other noxious compounds, and clean combustion make DME a versatile and promising solution in the mixture of clean renewable and low-carbon fuels under consideration worldwide. It has also a remarkable potential for increased use for electric power generation, and in domestic applications such as heating and cooking. More information can be found on International DME Association (IDA).